Selamat Datang to the Low Yat Plaza Kuala Lumpur, Malaysia! 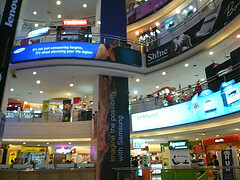 This highly concentrated IT mall, which is not to be mistaken for low fat pizza, is in the Bukit Bintang commerce area of the city, and it's the Malaysian capital's premier IT shopping place. 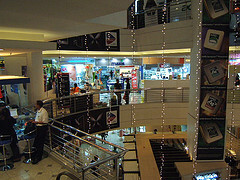 In fact, this shopping mall was voted the best IT Mall by readers of 'HWM Malaysia'. Low Yat Plaza is where you come to find anything related to computer software, hardware, electronics, audio-visual equipment, cell phones, digital cameras, stereos, and so on and so forth (and we do mean anything). There's plenty of space and there's a vast array of products from which to choose. Sushi King, Coffee Bean, Starbucks, The Outback, and a food court that sells lots of Asian food are all here, too, along with a 204-terminal Internet cafe where you can pretend to be a Nigerian scammer or a Chinese World of Warcraft gold farmer! You do have to be a little careful here, though. As a still-emerging market, Asia offers a combination of fantastic prices on quality merchandise and knock-offs that seem like steals. Be cautioned, even knock-offs are graded these days. They have the highest to the lowest quality. Choose well or stay with the brand names unless you have a gambling habit that you just can't kick. 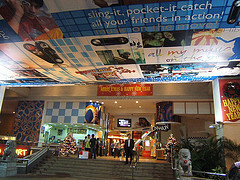 However, Low Yat Plaza does not sell pirated computer software. The Ministry of Domestic Trade and Consumer Affairs found out about a few shops within the Plaza that were run by pirates (they might have been tipped off by the skull and crossbones hangings) and they quickly moved in to shut them all down and get them replaced with legitimate businesses. If you're a geek you'll be in ecstasy when you see all of the notebooks, PCs, PDAs, computer games, digital cameras, scanners, home theater systems, and IT peripherals that this place has to offer. They even sell the TOUCH DIAMOND! The official Malaysia Encyclopedia says that Low Yat Plaza "stands out by offering a greater range and variety of a single product by having a collective of inter-chained stores." This is in contrast with streamlined arrangements in other electronics malls. Therefore, this place allows the consumer to have greater buying power and freedom in selecting the products or electronic parts they wish to purchase. Most parts that are sold here are negotiable and many stores also offer their services to assemble the parts a customer purchases. Each floor within the complex has its own specialty such as laptops, mobile phones, etc. As if that all isn't enough, the place has a shrine devoted to Beng Sifu and Lian Che, the patron gods of Ah Bengs and Ah Lians. And, the Ye-loo Heer and Fengtau Wahlau festivals that are held in the gods' honor are held here, too. So, the Low Yat Plaza would seem to be a holy place. But any foreigner who comes to it could tell you that, even if he never even saw those shrines.